The problem with Mr. Walgren’s argument, we believe, you will find will be this: at the end of the Trial, you will be given a jury charged to make a determination about whether somebody committed a crime. You will not be asked to determine whether or not Dr. Murray is negligent in the abstract, or whether he is a good doctor in the abstract, you will never be asked to determine whether Doctor Murray should have been the cause of Michael Jackson’s death. You will be asked to determine what was, who was the cause of Michael Jackson’s death. The science in this case, the pure science, the evidence in this case, we believe is gonna show you this. Despite everything that had gone on in the past, despite anything that had gone on during that day, during the 10 hours on June 25, 2009, while Michael Jackson was frustrated because he could not sleep, frustrated because his doctor refused to give him a drug that he preferred, that he wanted, he did enact without his doctor’s knowledge, without his doctor’s permission, against his orders, he did enact that caused his own death. What we believe the evidence will show you is during those 10 hours, the science will show you that Michael Jackson swallowed eight 2mg Lorazepam pills, pushing his blood concentration of Lorazepam to 0.169ug/ml. And the experts will tell you that that is enough to put 6 of you to sleep. And he did this when Dr. Murray was not around. We believe the evidence will show you, the scientific evidence will show you that when Dr Murray left the room, Michael Jackson self administered a dose of Propofol that with the Lorazepam created a perfect storm in his body that killed him instantly. When Dr Murray came into the room and found Michael Jackson, there was no CPR, there was no doctor, no paramedic, no machine that was gonna revive Michael Jackson. He died so rapidly, so instantly, he didn’t even have time to close his eyes. The judge has told you that the defense does not have the requirement to put on any evidence. We will. We will provide you the science to show you what happened. We intend to, in this case, provide to you answers to two questions. First how did Michael Jackson get to this desperate point? And second what happened when Dr. Murray was out of the room? One of the things Mr. Walgren told you in his opening was that Michael Jackson was preparing was preparing for a concert at the O2 Arena and he was but he undersold it a little bit. Because what Michael Jackson was really preparing to do at the O2 Arena with ‘This Is It’ was create History, not just for us, for himself. You’ll hear from Randy Phillips who is the president of AEG Live, you will hear from Kenny Ortega who is the co-choreographer of the ‘This Is It’ production and you will hear from Paul Gongaware who is part of the production team for ‘This is It’. What they will tell you is that Michael Jackson had not performed for 10 years and this particular series of concerts were going to be his absolution. He needed to do these show. They are gonna tell you that he was intimately involved in every aspect of the production. I don’t know what impression you came in with about Michael Jackson. He wasn’t just brilliant artistically, he was a smart man. He was involved in every aspect of that production, the dance, the music, he chose the songs, he wrote the songs, the 3-D effects of the show, the movie clips, this was his show, this was how Michael Jackson was gonna be remembered, it doesn’t matter what happened in the past. This was going to be his memory. He needed to do these shows. Randy Phillips will tell you that it was not just gonna end with ‘This Is It’. The contract provided that, if you were to complete these shows, he would have the ability to pack it all up for a World Tour. I believe Randy Phillips will tell you four segments of a World Tour that he could perform at. And when ended that, Randy Phillips will tell you and you will see in Michael Jackson’s own handwriting his plans for 4 to 5 movies including a 3D version of thriller. Randy Phillips will tell you that this equated for Michael Jackson at the age of 50 hundreds of millions of dollars. Randy Phillips will tell you that with the World Tour, there would not even be a close second to what he could earn. All he had to do was the O2 shows to set this in motion; all he had to do was complete these shows. The problem was he was never going to be able to these shows. Michael Jackson had a problem that no amount of determination, no dedication, no talent would ever overcome. And he knew that he needed help. In the spring of 2009 Michael Jackson went out looking for that help. In January 2009 Michael Jackson met with Randy Phillips again this time to sign the contract. Paul Gongaware was there. They met at Michael Jackson’s residence, they signed the contract. Michael Jackson signed in his name and he signed as president of Michael Jackson Company. Randy Phillips will tell you that Michael Jackson was nervous. The contract read for up to 31 shows. Michael Jackson of all people was afraid he wouldn’t sell the tickets. You will learn that it sold so quick, the ticket sales were so fast, that a mere week after presales, these are not the real sales, these are the presales, they have to increase the shows to 50. And Michael Jackson said he would do it, he would increase those shows to 50 on two conditions. One, that he had a house for him and his children with a 16 acres and horses. And two, that the Guinness Book of World Records would be there to record a historical event. You see 50 shows for a 50 year old man in one arena that 25000 people, over a million people would have come to see Michael Jackson. That has never been done before. And Michael Jackson knew it. This was it for him. And he named it himself ‘This Is It’. And for him it was. In March 2009 he made the announcement at the O2 Arena.You will hear about the announcement from Randy Phillips as well. During this time, negotiations, contract signing, the meetings, all the conversations about this Tour, Dr Murray was helping patients. You will learn in this trial about who Dr. Murray really is. You heard what Mr. Walgren says ‘oh he was greedy, it was all about money for Dr. Murray.’ But you will hear in this Trial who he really is. Dr Murray is no celebrity doctor. He doesn’t have an office in Beverly Hills dispensing pills to rich and famous. He is a cardiologist. He is an interventional cardiologist. He has two practices; one in Houston, my hometown and one in Las Vegas. Every week what Dr. Murray does, he performs angioplasty procedures, where he sifts a catheter through an artery, sometimes in the groin, sometimes in the leg, sometimes in the arm, to the part of the artery that is clogged. These are procedures that require anesthesia, sedation. He literally saves lives. He only takes care of people who had a heart attack or who are about to. That is who was, that’s who he is. Mr. Walgren said that because $150,000 was so lucrative that he would provide any drug for Michael Jackson. Let me tell you about Dr. Murray’s greed. We are going to bring to you patients of Dr. Murray. These are patients who understand Dr. Murray’s character traits in the context of what matters most: as a doctor. We are gonna bring patients from Las Vegas and we are gonna bring you patients from Houston. You are gonna meet Ruby Mosley, for instance. Ruby Mosley is an 82 year old woman from Acres Homes from Houston, Texas. She will make you very happy to be alive when she testifies; you will like her very much. She has been secretary for the Acres Homes Community Development Associate for 40 years. She will tell you that she met Dr. Murray at his father’s funeral. See his doctor [sic] (blogger's note: I think Chernoff meant his father) Dr. Andrews was the only doctor Acres Homes had. Acres Homes is the poorest community in my home town. Dr Andrews was the only doctor that Acres Home had. When his father died, Dr Murray vowed to open up a cardiology practice at Acres Homes because of the vacuum of care that had been created when his father died. Dr Murray two weeks later came in build a cardiology practice and started treating patients. Ruby Mosley will tell you, there is no money to be made at Acres Homes. The odds of anybody in that community seeing a cardiologist was about likely as going to the moon. Ruby Mosley and other patients will tell you that they came to see Dr. Murray, nobody asked how you are gonna pay. If you couldn’t pay, Dr. Murray wouldn’t charge you. If you had Medicare, he wouldn’t change you any extra what Medicare would pay. He’d buy prescription for these patients if they couldn’t afford to do it. Look, I’m not telling you that this information is provided to you because we are asking you to do one free one, that he has been a good guy so acquit him. We won’t have to do that. I’m telling you this because if the prosecution is gonna get up here and tell you he is greedy and callous and reckless, you need to hear the full story about it. And we’ll provide you that information. What you’ll learn about Dr. Murray is, as Mr. Walgren pointed out, he met Michael Jackson in 2006. It is the only celebrity he’s ever known. He met Michael Jackson because one of Michael Jackson’s bodyguards, while he was in Vegas knew Dr. Murray because he had saved or helped his father. One of Michael Jackson’s children’s was sick and Dr. Murray was called out to the Hotel. That’s how he met Mr. Jackson. Frateously. You’ll learn in the statements that he made to the police, please understand that what was played was only a part of that conversation; you will get to hear all of it. But in his statement that he made to police, he explained that Michael Jackson and he became friends; friends first. Michael Jackson would share with him things about his childhood, about his family, about his life, his dreams, his hopes. They were friends first. You will learn thru medical records that will be provided to you by us that between 2006 to 2008 Dr Murray did treat Michael Jackson. He treated him thing like toe fungus, for subluxation of the hip, treated him for a broken foot, tested his heart to see if that was okay, did blood test to see if his liver was okay. On two occasions, Michael Jackson told Dr. Murray ‘I have anxiety and I have trouble sleeping.’ Two occasions. And Dr. Murray who knew nothing about the real problem that Michael Jackson had prescribed Restoril which you will learn for Michael Jackson was about as effective as water. I don’t recall if Mr. Walgren told you this. He may have in his opening statement. But you will learn in the evidence in this case is that Michael Jackson he didn’t have insomnia. Insomnia is a medical condition or a symptom. You won’t learn that he had insomnia. He didn’t have trouble going to sleep, he didn’t wake up in the middle of the night, watch TV, had a bad day the next day. Michael Jackson had an absolute, total and thorough inability to sleep. Not for minutes. Not for hours. For days. On June 27, 2009, and Mr. Walgren mentioned this, I wanna be a little more specific about what happened on that day. 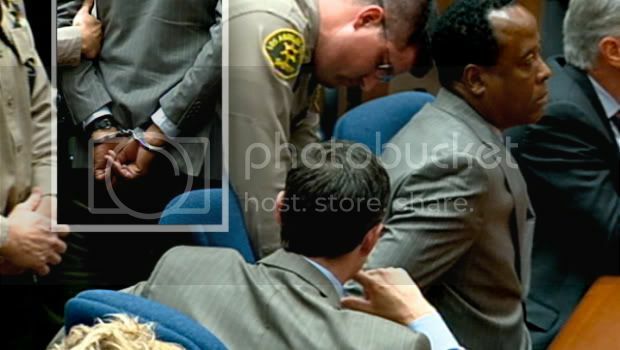 On June 27, 2009, two days after the death of Michael Jackson, Dr. Murray and myself and Michael Pena-sitting over there, from Houston, who knew Dr. Murray-we met with police detectives at the Ritz Carlton in Marina del Rey. The only thing that we chose was the location because we were staying there and the time because he had to fly in. But you will learn that everything else at that meeting was decided by the police, Detective Martinez and Detective Smith. You will learn that prior to that meeting a phone call was made to Dr. Murray and Michael Pena returned it immediately and said ‘yes of course we will come and talk to you.’ And you will learn that it wasn’t just Dr Murray who had a lawyer in this case, 9 of the People’s witnesses also had a lawyer in this case. It was just that type of case. He will tell you about the conversation, about what the conversation was about. At this meeting with Detective Martinez and Detective Smith, Dr. Murray told the detectives about Michael Jackson problems, about his sleep problems. He told them about the discussions in the spring of 2009 when Michael Jackson came to him and asked him for help. What you will hear in this meeting is Dr. Murray talking about Michael Jackson’s desperation, Michael Jackson’s need. Michael Jackson told Dr. Murray that he had inability to sleep and the only way that he could sleep was on Propofol and that he had always slept on Propofol when he was touring. Dr. Murray told the investigators, this took him back. This didn’t make any sense to him. Michael Jackson told Dr. Murray how Propofol was applied, he told Dr. Murray that it needed to be used with Lidocaine, he told Dr. Murray that he had a nickname for Propofol. He called it his milk. And when you see Propofol, in person you will understand why he called it milk. Michael Jackson told you Dr. Murray that you had to give it with Lidocaine otherwise it would burn. And his nick name for Lidocaine was anti burn. Dr. Murray told police investigator he was surprised that he knew so much about Propofol. He was concerned for Michael Jackson said he was going to use Propofol irrespective of Dr Murray. So Dr. Murray told investigators that yes, he agreed. He agreed to help Michael Jackson sleep, he agreed to provide Propofol. Mr. Walgren pointed out that they are going to have experts to say that will say that a mere act of providing propofol for sleep is negligent. He spent a long time in his opening statement talking about that. What you will learn from evidence though is this. 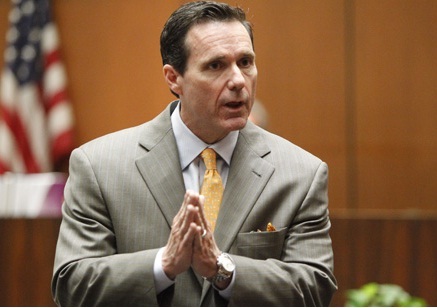 Dr. Murray provided Propofol for sleep for two month for Michael Jackson. Two months. For those 2 months that he provided Propofol to Michael Jackson, Michael Jackson slept, he woke up and he lived his life. He went to work and he continued with what he needed to do. The evidence will not show you that Michael Jackson died when Dr. Murray gave him Propofol for sleep. 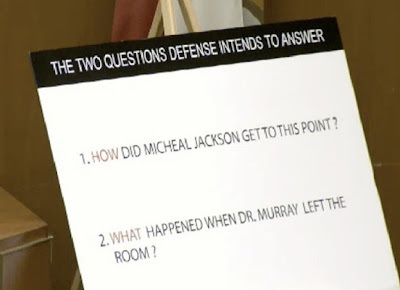 What the evidence is gonna show is that Michael Jackson died when Dr. Murray stopped. You’ll see in this in these Applied Pharmacy records not just the Propofol that was ordered, by the way the amount of propofol that was ordered was exactly the amount that Dr. Murray, you will see our experts will show you, is exactly the amount that was necessary to do exactly what he said he did. And no more. You will see in those Applied Pharmacy records Dr. Murray also ordering Midazolam and Lorazepam because he’d hoped that he could switch to those sedatives, to wean Michael Jackson off of Propofol so he could sleep naturally. What he told police investigators and was left out in the opening statement was that on the day that Michael Jackson died, this was a third day of a weaning process. On June 22nd, three days Michael Jackson died, Michael Jackson finally agreed to let Dr Murray to try to get him off this Propofol. You will learn that on that day, Dr. Murray gave half the Propofol he would normally give. Normally he would give 50mg in an injection and then a drip to keep the blood levels up, that would be his normal process for the two months prior. But on the 22nd he gave half of each and gave Lorazepam and Midazolam and Michael Jackson slept. And the next day, he got up and he went to work. On the 23rd and it’s June 23rd 24th because the evening goes in to the morning but the next day, Dr. Murray provided Michael Jackson NO Propofol at all. It was the first night in two months that he slept without Propofol and he used only Midazolam and Lorazepam. On the day that he died, the plan was not to give Propofol. The plan was to go to the Midazolam, the Lorazepam. That’s why you hear this recording ‘please give me the Propofol’ because for 10 hours on the 25th Dr. Murray refused and instead giving him Midazolam and Lorazepam. Dr. Murray told police instigators that as 10 o’clock approached, Michael Jackson start begging for Propofol. He was confused. He told police investigators he didn’t understand why he wasn’t sleeping. Why wasn’t he sleeping? He had slept the night before. He told investigators that he was so confused, he literally reached under the bed sheets to see if maybe the medicine that he was giving him was leaking onto the bed and it wasn’t getting into Michael Jackson. He didn’t know what was happening, he didn’t understand. One of the things that u r gonna learn about certain personality traits that Michael Jackson had. Not bad traits but personality traits. What u r gonna learn about Michael Jackson is that he had a habit of compartmentalizing relationships; packaging relationships. Like spokes in a wheel. The wheel in his life turn but the people that he associated with were like spokes they rarely ever touched. You will hear from the security staff that they necessarily knew where Michael Jackson went during the day b/c they take him there but they were not allowed inside the house. Except to use the restroom by the kitchen, they weren’t allowed to know what was going on inside the house. You will hear from Randy Phillips, the President of AEG Live who will say that in order to talk to Michael Jackson, he had to go thru Michael Amir. And they didn’t know what he was going when he wasn’t at rehearsals. Dr. Murray told police investigators he didn’t know what Michael Jackson did during the day when he was at home sleeping. You will hear about situations with his Family. One of the spokes in Michael Jackson’s wheel was a Beverly Hills doctor by the name of Dr Arnold Klein. We will not be able to call Dr. Klein as a witness, or his staff, but we will be able to provide you medical records that we subpoenaed that described the treatment that Michael Jackson received at Dr. Arnold Klein’s office. Dr. Arnold Klein is a dermatologist by trade. And you will see from these medical records, they will be like footprints in the sand, you will see where they lead. Dr Waldman will talk about the events that occurred, you heard some of it from Mr. Walgren today. The events that occurred the week before Michael Jackson‘s death. You will learn that Michael Jackson received a shot of Demerol on June 16, 2009 he had rehearsal scheduled that day, he attended that rehearsal. You will learn that he attended the next rehearsal on the 17th but he missed on the 18th, he just didn’t show up and on the 19th, he was absolutely unable to perform, he had chills, he was in pain, he was sick. Dr Waldman is going to explain to you what he believes was happening during that week And he is going to explain to you what he believed was happening thereafter as we got to the 24 and 25 of June. And what he is going to tell you is that Michael Jackson was suffering from the Demerol withdrawal and his insomnia was partly a least as a result. Now Michael Jackson told Dr. Murray that his insomnia was as a result of his mind always racing, always moving, always producing, he just couldn’t keep still, it was the genius in him and perhaps partly that was true, we know about people like that. But Dr Walden will tell you it was also the Demerol. These were not false words to Michael Jackson; they were not false words to Dr Murray. B/c what u will learn is that the week prior when Michael Jackson failed to show up to rehearsals on the 18th, when he was unable to perform on the 19th as they moved this entire production to Staples Center, a meeting that was held on June 25 was not for Michael Jackson’s benefit; it was an emergency meeting. This would have been the third meeting that they would have to have and you will see an email between Kenny Ortega and Randy Phillips where the conversation was about pulling the plug. After the meeting on June 20th, Michael Jackson‘s performance was much better on the 23rd and the 24th, you will see video of that. What you will not see is video of the other rehearsals. So when Michael Jackson told Dr. Murray ‘I have to sleep, I have to get some sleep, they will cancel my rehearsals, I will lose this this performance’ he meant it, Dr Murray knew he meant it. At 10:40 while Michael Jackson is saying this, Dr. Murray agreed to give him some Propofol, Dr. Murray told the police investigators he knew that he had to be up at noon. He knew that. He knew that he had Lorazepam and Midazolam already in his system, he knew that. He agreed to give Propofol but only 25mg injection. What you saw in the picture from Mr. Walgren, please understand that that is a 10cc syringe. What he told investigators was that he pulled in in that 10cc syringe Propofol and Lidocaine. And u will learn from one of the Prosecution’s experts that that is an half and half proposition based on the science and we’ll discuss that later. What Dr. Murray gave was 25mg but it was 5ccs. And u will see in the toxicology that the Lidocaine that was in Michael Jackson to fair that out. When Dr. Murray did this, he told the investigators, Michael Jackson went to sleep. And what he said was more that what Mr. Walgren told you. What he said was ‘I checked the pulse oximeter to see his oxygenation; it was in the 90s which is very good. I checked to see if his pulse was normal, it was in the 70s which was normal for Michael Jackson. And I sat and I watched and I left only when I felt comfortable. So when Mr. Walgren talks about abandonment, what you have to understand is by the time that Dr. Murray left that room, there was zero propofol in his system and we are gonna explain why that was. I wanna leave you at the point where Dr. Murray has left that room. 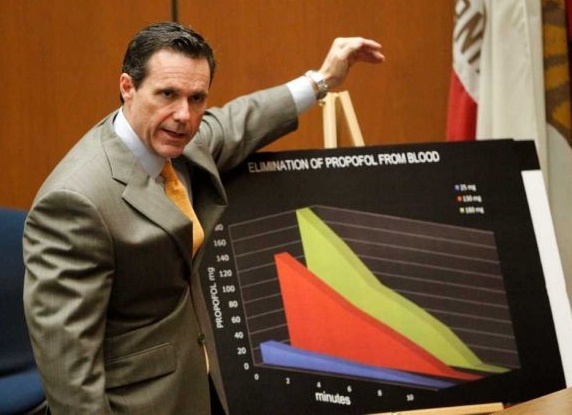 I told u on jury selection that this was gonna be a scientific case. Remember I asked all of you ‘would you be willing to listen?’ I am not saying abandon your heart at the door, I am saying listen to the science and you will know the truth and you all said that you’d do that. I wanna explain to you some things, some propositions about Propofol that were not explained to you. And I know all of you are fair and you will not take into consideration what u saw on TV. But in case u have some notions about Propofol that are false, I wanna make sure that u know exactly what it is and what it isn’t because in this case, that is gonna matter. We are going to also put experts on the stand. The expert that we have, his name is Dr. Paul White. Dr. Paul White is the preeminent expert in Propofol. He is internationally known for intravenous sedative and anesthetic medicine. He was past president of American Society for Ambulatory Anesthesia. He was a professor in medical school for anesthesia at Stanford Washington University and just recently University of Texas in Dallas. You will learn that one of the People’s experts was his student (blogger’s note: Dr. Steven Shafer testified that he was not Dr. White’s student, they were colleagues). You will learn that the coroner when developing a list of experts to use to determine things about Propofol listed up at the top of the list Dr. White. Dr White is known, by his peers, as the Father of Propofol. He will tell you that it was his, mostly his involvement in developing the protocol for use of Propofol in this country for conscious sedation. He’s either written over 800 books, either written or co-authored over 800 books on anesthesia sedation. Here is what he is gonna tell u about Propofol. For purposes of what you are gonna hear in the evidence, I’m gonna go into 3 details, might be 4, I might have got that wrong but bear with me. First is Propofol is normally used as an intravenous drug, another words you either inject or you drip it. Sometimes it is used both, we’ll explain what that is. Propofol is not a poison, it is not a neurotoxin. It has one job to do, it only has one job to do and that is to put people to sleep. If u give enough Propofol then what Mr. Walgren said is true. U can even involve urself in invasive surgery, u can perform operations, and we are used to seeing blinking lights and respiratory devices and that’s the kind of thing that Mr. Walgren told you about. But what Dr White will tell you is this. When u perform invasive surgery, then u use the amount of Propofol that is necessary for invasive surgery. Propofol is both powerful and dangerous. What the PDR tells you is that when u r performing invasive surgery, heart surgery, gastroenterology, that is the wrong phrase but a surgery that requires you to cut a patient open, the amounts that is used is recommended to be 2 to 2.5 mg/kg. Another words for somebody about 150lbs, Michael Jackson’s size (blogger’s note: the autopsy states that Michael Jackson was 136 pounds at the time of his death), what Dr. White will tell you is you are looking at somewhere over 130mg. With that much Propofol, there is a danger, he will tell you that with that much Propofol, it’s not that there is a danger that is just gonna stop your heart. It is not poison but there is a sincere risk of an apnea event, another words the obstruction of the upper respiratory…you know what I am talking about. We are used to sleep apnea, right but we wake up, you don’t die. If u have this much Propofol, in your system, you can’t wake up. That’s the danger of Propofol, the apnea event. But what Dr White will tell you is that Propofol is most often used, normally used, not for invasive surgeries. It is used for sedation and it is used in amounts far less than what would be necessary for this dangerous procedure. For Propofol, it is a matter of degree. Dr. White will tell u that when you get Propofol in these amount, 25 to 50mg, the amounts that he will describe to you as “conscious sedation” He will tell u there is no danger of an upper airway constriction, none, listen to what I am saying, he is gonna tell you none. And he is gonna tell you that there is no risk of cardiac effect. He didn’t make that up. That comes from the American Society of Anesthesiologists’ documentation for use of Propofol for non-anesthesiologists. It is a known fact. For Propofol it is matter of degree. Dr. White will tell you something else very important for you to understand. Propofol is not unique and that it is a matter of degree. Dr. White will tell you that the precautions are also matter of degree as well. You will hear him explain the difference between what is necessary for conscious sedation and what’s necessary for invasive surgery. Propofol is not unique in that regard. Medicines in general usually are matter of degree. If you take one Tylenol, you may get rid of headache; you take a bottle, you may get rid of your liver. It is a matter of degree so Propofol is not unique. But it is unique in one very important respect. This is so unique to Propofol that Dr White may that there is no other drug like it. Propofol acts very quickly. We are familiar from 100 to 1, you get to 99 and you are done. It works very quickly. What important about Propofol is that it also dissipates; its clinical affects disappear much quicker than the other drugs. And it is an important distinction: It doesn’t even matter how much you give in an injection. 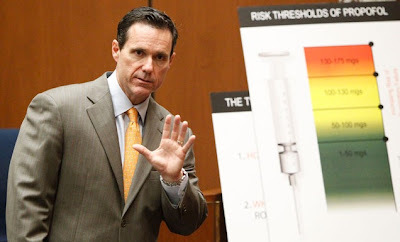 What Dr. White will tell you is that if you give 25mg of Propofol, he will tell you that there is no danger there; he will tell you that 25mg will dissipate, there will be no Propofol in the blood in 10 minutes. The same is true for 150mg 130mg 120mg 180mg 110,000mg. In 10 minutes no matter how much you give in an injection, there is nothing left. So when we talk about abandonment in this case, that is an important point for you to understand. Dr. White will explain both how that is and why it is. When this case ultimately concludes, the defense believes that the science will explain what happened. But we believe that ultimately the difference of opinion between the Prosecution and the defense will, this simplifies it but it explains it perfectly the difference will be the difference between what Dr. Murray said he gave 25mg and the 100 plus mg.
Mr. Walgren said that their experts will tell you that the amount that was found in Michael Jackson in toxicology is consistent with major surgery. We believe that what their experts will say, in fact our experts will say that that’s going to be an amount larger than 100mg. You are gonna hear Elissa Fleak testify. She is gonna explain what was at the scene. She will explain the things that were found. She is a coroner investigator. She is gonna tell u what was found at the scene. Although the prosecution did not tell you what theory is about how we got to this point, they said something to you about “maybe there was a drip” something like that. I don’t remember the exact words. We are going to, in this case, demonstrate to you not only is it improbable that there was a drip, it was not possible. So the question that will come up in the jury room is ‘how did Michael Jackson get more Propofol?’ And these will be the two numbers (25mg vs. 100 plus mg) you will be wrestling with scientifically. Now during the jury selection, you recall Mr. Walgren talking to you about the charge. I remember him talking to you about how an act cannot be the cause of death unless it is a substantial factor. I wanna give you the rest of the story. Here is what you will have in the jury room with you when you make a determination in this case. You will be told that an act can only be the cause of death if the death is the direct, natural and probably consequence of the act. You will further be told that a natural and probably consequence is one that a reasonable person would know is likely to happen if nothing unusual intervenes. We believe that Dr White is going to testify that in his expert opinion, Dr. Murray could not have killed Michael Jackson, could not be responsible for this death. He will tell u that the amounts that Dr. Murray gave were not capable of causing this death. He will tell u that the precautions that Dr. Murray took for these amounts were sufficient and he is gonna tell you what precautions are used in doctors’ offices, in gastroenterology clinics, dentist offices, where nurses give this drug. Dr White is going to tell you that if Dr. Murray gave him that amount [25mg] it would not have killed Michael Jackson, in 10 minutes there would be zero Propofol. He will tell you that after 10 minutes, there would be no measurable amount. The science will prove that there had have been more Propofol delivered to Michael Jackson when Dr. Murray left the room. Had to be. We will ask every single expert that the prosecution presents, everyone, this question, if the drugs that Michael Jackson received on the 25th was exactly what Dr Murray said, would that have killed Michael Jackson? Every of them will tell you no, we believe. And every of them will tell you that there had to have been more Propofol delivered, provided, taken by Michael Jackson after the period of time that Dr. Murray left that room. Prosecution has not told u what their theory of that is. That 25 to 100. I don’t know exactly what it is yet. But the defense believes that the evidence will show u that the delivery of that Propofol was through Michael Jackson himself. We talked about Lorazepam. Let’s talk about that more specifically because we believe that what happened with Lorazepam shows you the state of mind that Michael Jackson was in during those 10 hours. What u are gonna find is the Lorazepam that was in Michael Jackson was in much greater amounts, high, great, high amounts. We talked about that 0.169 You are going to hear that what Dr. Murray said he gave Michael Jackson was 4mg which would have been about 0.04 as opposed to 0.169. Now, the prosecution can say well he just gave more but let’s talk about what that more means. If Dr. Murray had actually given him the amount of Lorazepam you are gonna find, it would equated to that kind of level, their experts will tell you that it would require 4mg of Lorazepam shot every 30 minutes for 5 hours. We obviously don’t think that anybody would do that much less our client Dr. Murray. The question is how did Michael Jackson get that Lorazepam in his system? What you are gonna learn today is that the coroner doesn’t necessarily have to test everything, they only have to do their job and the prosecution doesn’t have to give you all the evidence, they only have to prove their case. Part of the autopsy involved stomach contents of Michael Jackson. Knowing that they did not test those stomach contents for Lorazepam, we did. And what we found is that the amount of Lorazepam in his stomach contents at the time of death was 4 times greater than what was found in his blood. And our experts will tell you that the only possible way that he could have that much Lorazepam in his stomach or any at his stomach at all was he was swallowing it that morning. We believe that the evidence will tell you this. Michael Jackson wanted to sleep for 10 hours, was frustrated, unable to sleep, couldn’t sleep, needed to sleep, needed to succeed. And his doctor would not give him Propofol, the drug that he wanted and Michael Jackson swallowed, while he was up and around in other rooms and the bathroom, up to 8 pills on his own without telling his doctor, without permission from his doctor. And when Dr. Murray gave him 25mg and Dr. M left the room, Michael Jackson self administered an additional dose of Propofol and it killed him. And killed him like that and there was no way to save him. We have seen pictures of his children; we have seen pictures of him bright and vivacious case on stage then compared how he looked when died. This is an emotional case. We all have a vested interest in Michael Jackson., if you are my age, you do. It’s tragic, whole thing is tragic but the evidence is not gonna show that Dr. Murray did it. At the end, we are gonna ask you to acquit him. Dr. Murray is not a perfect man; he is an imperfect man like all of us, that I grant you. But in this criminal court, we believe he is not guilty. The Lorazepam found in the stomock content is way way smaller, what are the defence going to be? @muzik do you think chernoff make good on his opening aguement so far? Yes, Lorazepam in gastric content was minuscule. The prosecution stance is that it is not even Lorazepam itself but its metabolite Lorazepam Glucuronide. The defense's stance is that Mr. Jackson took 8 Lorazepam pills at/around 9am. Lorazepam half life is 22 minutes. What that means is in every 22 minutes, the drug concentration in the body reduces by half. So the defense's stance is that by 12pm, the Lorazepam in stomach was dissolved, hence the minuscule amount. It's hard to say if Mr Chernoff did good on his opening. It will depend on the two experts they will call: Addiction expert Dr Robert Waldman and Propofol expert Dr. Paul White.